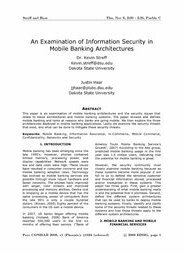 This paper is an examination of mobile banking architectures and the security issues that relate to those architectures and mobile banking systems. The paper reviews and defines mobile banking and looks at reasons why banks are going mobile. We then explore the three architectures deployed in mobile banking applications. Lastly we examine the security threats that exist, and what can be done to mitigate these security threats.